"Working with Legacy Land Auctions was easier than I could have ever expected. I had a client interested in a tract to be auctioned by Legacy, and registering my buyer was as simple as a quick email. Legacy handled the rest. Legacy ensured my client had a smooth path to closing and took care of all the details along the way. Unlike some other auction companies, Legacy Land Auctions encourages agents to participate in their auctions – sharing a generous commission in the end. I’ll certainly encourage my clients to participate in Legacy auctions in the future." "We couldn’t have put our family’s property in better hands. From the start of the process through closing day, the entire team at Legacy respected the history in our operation and did all they could to ensure the most successful outcome possible. There are lots of folks who can sell land, but for us, the team at Legacy stands out not only because of how they treat people but how deeply they appreciate the land that has been so important to three generations of our family." Legacy Land Auctions is leading the way in farm and ranch real estate auctions. At past auctions I have been blessed to have represented both buyers and sellers. Working with the Legacy team was a great experience from start to finish. They are professional from the top down and take great pride in making sure all the details are handled for buyers and sellers. Unlike other auction companies, Legacy offers to pay the representing agent a commission for representing buyers at the auction. This encourages other agents to bring prospective buyers to the auction, increasing competition for the property and benefiting the seller. 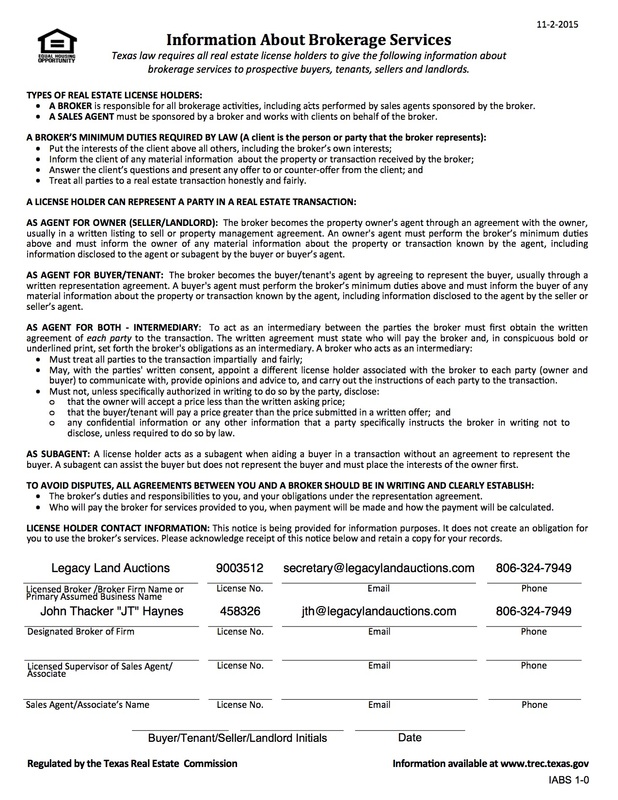 If you are considering an auction, I would definitely consider using Legacy Land Auctions as your auction company. They are a company that genuinely cares about your property and the legacy behind it. “The sales process can be cumbersome and burdening…. Unless you have experts that care about you and your outcome over all other. The Legacy experience for us exceeded our expectations. Great people to work alongside. "We were very pleased with the outcome and auction process."